We talked with Luke about his teaching experience and what his goals are for the coming school year. He will share his own blog posts here throughout the school year. Check back every month or so! 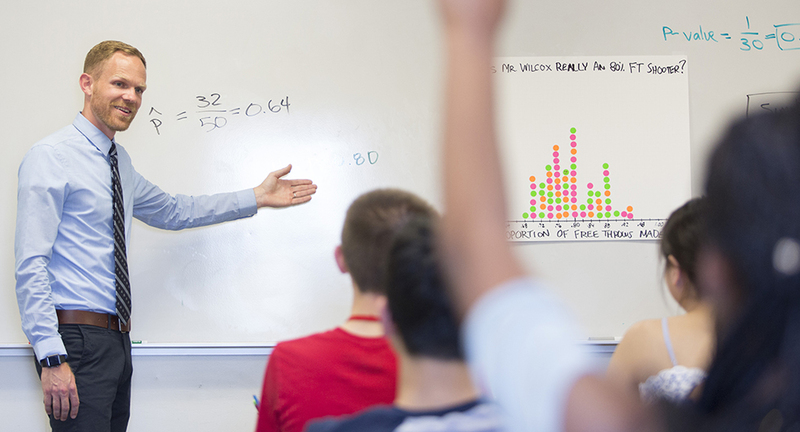 I have taught mathematics my entire career of 16 years at East Kentwood High School, which includes teaching courses ranging from Algebra 1 to Advanced Placement Statistics. I was a part-time Academic Support Coach for four years and have been the mathematics department chairperson for seven years. I have also taught math courses at Grand Valley State University as an adjunct professor. What is your mission as Michigan Teacher of the Year? Encourage, support and grow new teachers, so the teaching profession will attract and retain talented, passionate individuals. The amount of growth that happens in the first years of teaching is explosive, and we must accelerate this learning to best shape the future of education. Inspire and empower teacher leaders to become actively involved in the vision, decision-making and implementation of impactful ideas within their schools and districts. These teachers will make intentional, effective and long-lasting change within their schools and districts that ultimately improves student learning. Highlight and celebrate the amazing teachers in the state of Michigan in order to further elevate the profession of teaching. Advocate for policy changes that give teachers more time and opportunities for quality professional learning experiences. This will have a direct impact on students, especially those that are disadvantaged. I’ll be partnering with the Van Andel Education Institute to create a physical space to accomplish some of these goals. What is the biggest change in your classroom from when you first started teaching? Early in my career, I thought that good teaching was only about knowing my content and using the best instructional strategies to deliver that content. Over time, I discovered students perform at their highest levels only when they are inspired and motivated for success. I now work very intentionally to develop student motivation. Through significant professional learning opportunities and collaborative discussion with my colleagues, I have developed some specific strategies to get students working to their potential. I do this by promoting a growth mindset for learning, developing positive relationships, growing a community of learners, establishing high expectations, and working to be inspirational! I have also found these strategies to be highly effective when working with teachers as learners. Teachers who are inspired and motivated are able to continuously reach for their professional goals. What are the most important things that your students have taught you? I continue to be inspired by the authentic appreciation my students have for diversity. East Kentwood High School is the most diverse high school in the state of Michigan, with students from over 50 different countries. By working together towards a common goal, my students understand and value the differences among each other. Students often present multiple approaches to problems in class, and we work to identify the similarities and differences in the work. Overall, my students have taught me to always be open-minded and listen to what people are saying, and to try and understand the viewpoints of others. What is your favorite story/event from teaching? Several years ago, I had a student named Deon in my Algebra 1 course who was taking the class for the fourth time. In previous attempts, Deon had made little to no effort and was far behind on credits for graduation. He was usually late to class, acted as if he didn’t care about school and often tried to put his head down instead of learning. Eventually, I was able to convince him to come in after school to work on his math skills. I found that Deon was a very quick learner, but lacked confidence. With some hard work, he started to find success. I got him connected with a mentor program working with my colleagues Carl Warfield and Laura Sloma. This support sparked Deon’s motivation, and he decided that he was going to graduate on time. Over the next three years, he approached his learning differently. He spent time with tutors, took after-school classes and frequently checked in with his mentors. He completed four years of classes in only three years, and became the first person in his family to graduate high school. I was so proud to hand Deon his diploma on graduation day. Deon is representative of the many students in Michigan schools who, when given the proper resources, can achieve great success. Who would play you in the Oscar-bait inspirational movie about your class and what would the movie be called? Do you have any words of advice for teachers (rookies or veterans)? Yes: Become the teacher that students remember later in life. Teaching is a truly honorable profession, and we have the opportunity every day to inspire students towards fulfilling and successful lives. We must remember to keep this at the forefront of our daily work. Focus your time and energy on what really matters: inspiring and empowering students towards success. Get to know each of your students individually. Know what success looks like for them, and find ways to inspire and motivate them towards those goals. Hold them accountable, but always provide the support needed to help them reach success. Please follow my adventures as 2017-2018 Michigan Teacher of the Year at my blog: http://www.lukewilcox.org/subscribe.